I believe that every great renovation starts with inspiration. There should ideally be one defining theme that knits the whole ensemble of design elements together into one magnificent orchestra. So why not choose your favourite cocktail? After all, you are creating an environment that you will want to enjoy your preferred potion in. It makes sense to create the mood to go with it and a setting that will perfectly accessorize your go-to elixir. Any drink worthy of its garnish conjures up a whole constellation of design ideas. Think of the martini, a legend in a glass. The martini is to cocktail hour what the Chrysler building is to Manhattan, a timeless classic. Its emblematic of Hollywood’s golden era and has more screen credits than Marilyn Munroe. Even inhaling its juniper berry bouquet for me conjures images of dark wood, wainscoting and chair rails, a Chesterfield sofa, amber tones, maybe some gold accents…. a little James Bond married with a hint of film noir. Although I love the martini and would be keen to design an apartment that embodied this testosterone driven drink, my own personal favourite is the Margarita. I don’t think that any cocktail surpasses it. 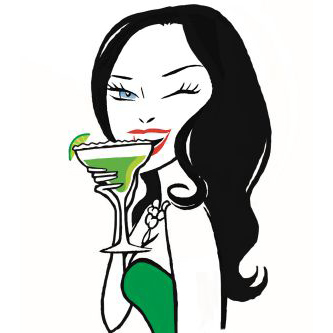 If the martini is a legend in a glass, the Margarita is a party in a glass. It dances on the tongue like Shakira doing a salsa routine. The tangy sensation of fresh lime gyrates with silver agave tequila, ice and a splash of sweet orange Cointreau. This liquid Nirvana takes one to another latitude with just one sip. It evokes love, laughter and endless summers. 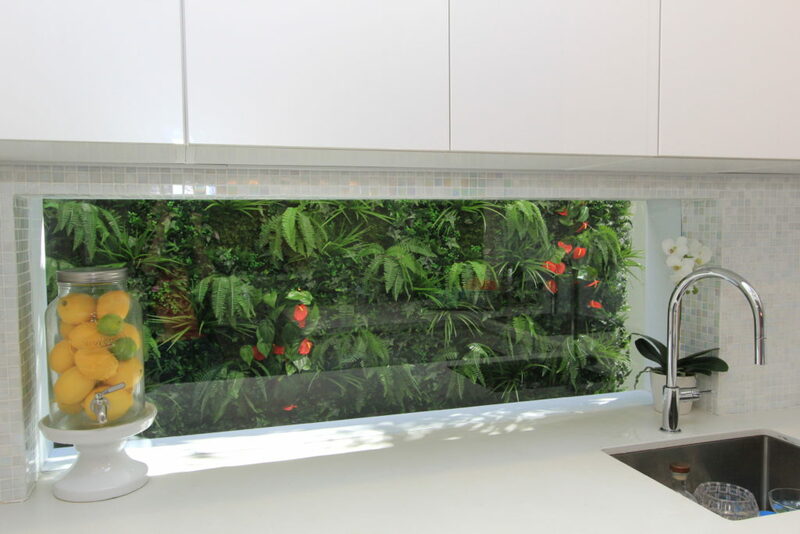 All considered, it was a natural for me to draw inspiration from the Margarita for my last renovation. It’s the perfect theme for a magical holiday apartment. The place was also in a woeful state. See the before and after pics in my next post if you want proof – trust me, it was more Methylated Spirits than Margarita. In that respect, it really needed something powerful, almost otherworldly, to take it from grunge to glamour. And nothing is beyond the supernatural powers of this bewitching brew. My daughter Bondi (also a Margarita fan) and I named the apartment “Adventures in Margaritaville and considered the makeover an ode to this sublime elixir. 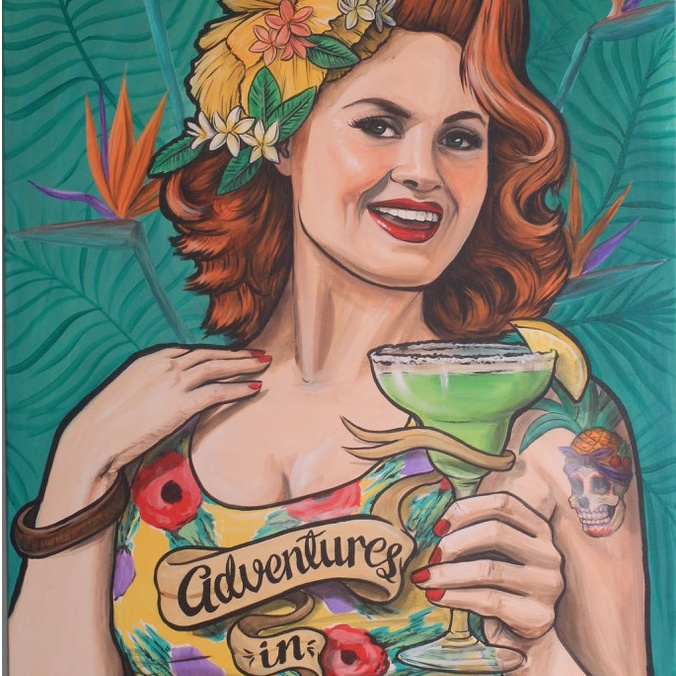 Firstly, before we even moved a brick, I commissioned an artwork from the supremely talented tattoo artist turned painter Fieldey to create a custom painting that incorporated our “Lady of the Margarita” enjoying this magical mix and bearing the apartment’s moniker in a scroll. This artwork embodied the essence of this dazzling drink and also symbolized the “divine feminine.” Lady Margarita helped define and bring the vibe to the rest of the build. One of the other key elements was reflecting the iridescence of the cocktail. It shimmers and shivers in the sun like one of Elizabeth Taylor’s diamond clusters. My aim was to make the apartment very light and create most of the contrast through textures and variations of white on white. 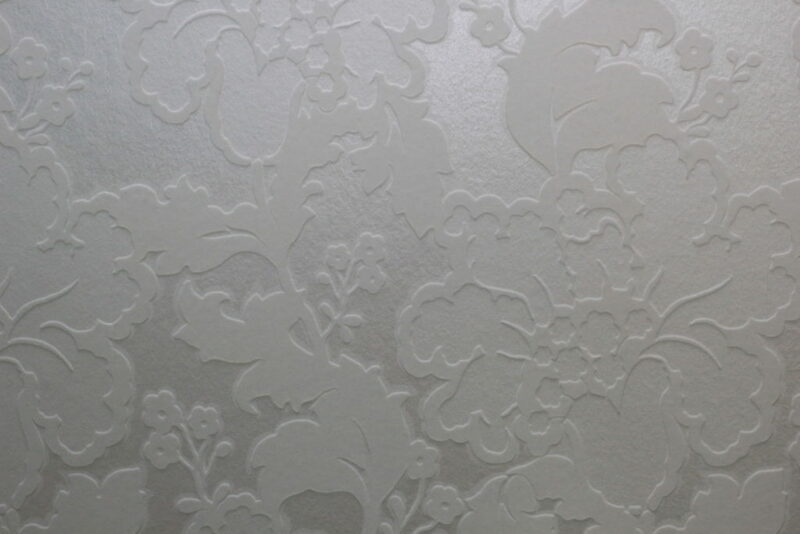 The accent velvet flock wallpaper in the master bedroom (we call it “the honeymoon suite”) features cream coloured flowers on white paper. 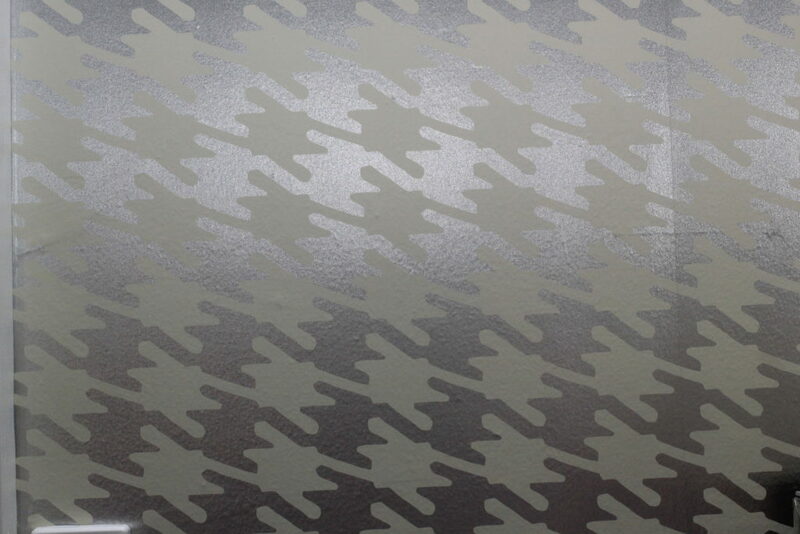 The houndstooth wallpaper in the hallway combines reflective beige with white. I matched this with a similar pearlescent beige paint on the ceiling. Subtle sparkles abound throughout to match the mischievous glint in Lady Margarita’s eyes. This theme translated to the ceiling, which hosts crystals aplenty. The Timothy Oulton chandelier that presides over the dining table also refracts the light into a million tiny rainbows. I also brought in more sun through shaftless skylights, which bring light in through fibre optic cable from a solar panel on the roof. Most importantly, I ensured all the lights have dimmers – I call this over thirties lighting. Dimmers are every girl’s best friend and key to controlling the mood and setting the scene for romance. While you want brightness, you don’t want to feel as if you are in a David Jones dressing room. 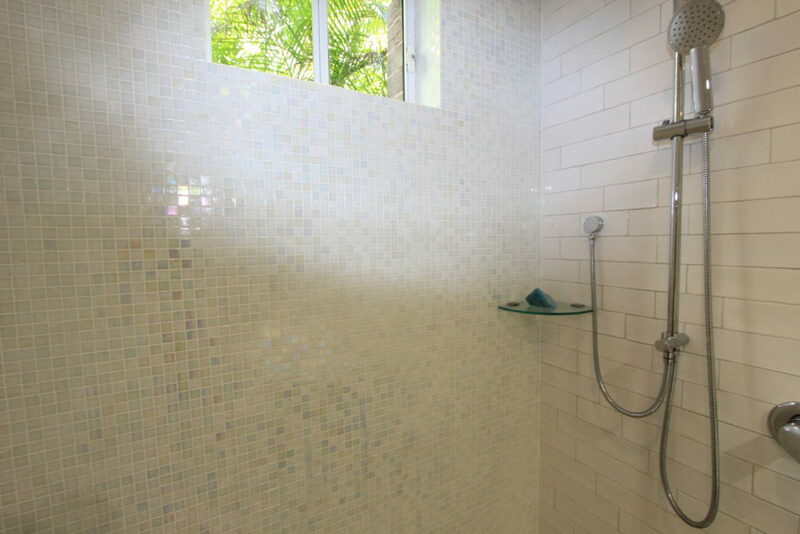 The Mother of pearl mosaics on the feature wall of the bathroom and the kitchen splashback add to the play of light on light. The subway titles in the bathroom contrast gloss and matt and two sizes to create subtle contrast. Ornate cornices, door moldings and appliques and add texture, as do the decorative plaster moldings in the ceiling. An ornate fireplace and albino stuffed peacock perched on the mantle further enhances the vintage glamour. 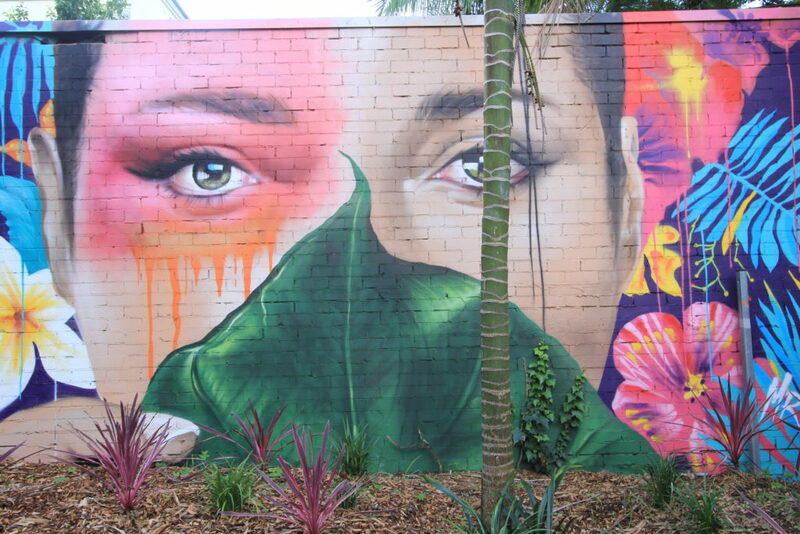 The piece de resistance is the tropical inspired mural in the backyard. The incredible Mr. G Hoete painted this stunning artwork featuring the face of a tropical version of Helen of Troy – the face that launched a thousand sips. It draws the eye from the minute you walk in the apartment. Our Islander femme fatale beguiles you with her stare and beckons you to leave mundane life behind and join her in a Margarita-inspired adventure. She certainly makes us want to get out the cocktail shakers and play the maracas. Let your spirit guide you in a new approach to décor!